If the invasive Asian carps (bighead carp Hypophthalmichthys nobilis and silver carp Hypophthalmichthys molitrix) migrate to the Great Lakes, in spite of the efforts to stop their advancement, these species will require the fast-flowing water of the Great Lakes tributaries for spawning and recruitment in order to establish a growing population. Two Lake Michigan tributaries (the Milwaukee and St. Joseph Rivers) and two Lake Erie tributaries (the Maumee and Sandusky Rivers) were investigated to determine if these tributaries possess the hydraulic and water-quality characteristics to allow successful spawning of Asian carps. To examine this issue, standard U.S. Geological Survey sampling protocols and instrumentation for discharge and water-quality measurements were used, together with differential global positioning system data for georeferencing. Non-standard data-processing techniques, combined with detailed laboratory analysis of Asian carp egg characteristics, allowed an assessment of the transport capabilities of each of these four tributaries. This assessment is based solely on analysis of observed data and did not utilize the collected data for detailed transport modeling. All four tributaries exhibited potential settling zones for Asian carp eggs both within the estuaries and river mouths and within the lower 100 kilometers (km) of the river. Dams played a leading role in defining these settling zones, with the exception of dams on the Sandusky River. The impoundments created by many of the larger dams on these rivers acted to sufficiently decelerate the flows and allowed the shear velocity to drop below the settling velocity for Asian carp eggs, which would allow the eggs to fall out of suspension and settle on the bottom where it is thought the eggs would perish. While three rivers exhibited these settling zones upstream of the larger dams, not all settling zones are likely to have such effects on egg transport. The Milwaukee River exhibited only a short settling zone upstream of the Grafton Dam, whereas the St. Joseph and Maumee Rivers both had extensive settling zones (>5 km) behind major dams. These longer settling zones are likely to capture more eggs than shorter settling reaches. All four rivers exhibited settling zones at their river mouths, with the Lake Erie tributaries having much larger settling zones extending more than 10 km up the tributaries. While hydraulic data from all four rivers indicated settling of eggs is possible in some locations, all four rivers also exhibited sufficient temperatures, water-quality characteristics, turbulence, and transport times outside of settling zones for successful suspension and development of Asian carp eggs to the hatching stage before the threat of settlement. These observed data indicate that these four Great Lakes tributaries have sufficient hydraulic and water-quality characteristics to support successful spawning and recruitment of Asian carps. The data indicate that with the right temperature and flow conditions, river reaches as short as 25 km may allow Asian carp eggs sufficient time to develop to hatching. Additionally, examining the relation between critical shear velocity and mean velocity, egg settling appears to take place at mean velocities in the range of 15–25 centimeters per second, a much lower value than is generally cited in the literature. A first-order estimate of the minimum transport velocity for Asian carp eggs in a river can be obtained by using mean flow depth and river substrate data, and curves were constructed to show this relation. These findings would expand the number of possible tributaries suitable for Asian carp spawning and contribute to the understanding of how hydraulic and water-quality information can be used to screen additional rivers in the future. 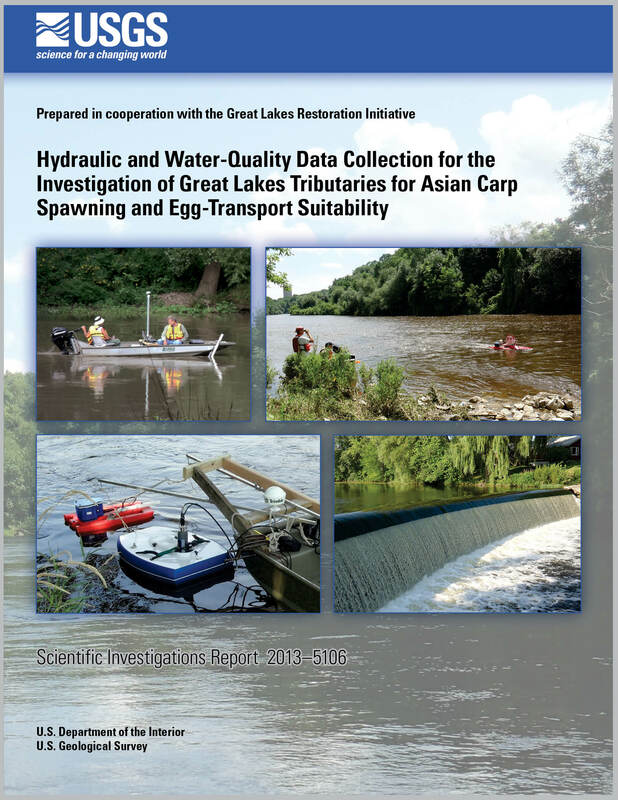 Murphy, E.A., and Jackson, P.R., 2013, Hydraulic and water-quality data collection for the investigation of Great Lakes tributaries for Asian carp spawning and egg-transport suitability: U.S. Geological Survey Scientific Investigations Report 2013–5106, 30 p., http://pubs.usgs.gov/sir/2013/5106/.